Just as many cigar rights advocates were getting used to referencing US House Bill H.R. 1639 (112th Congress) – known as the “Traditional Cigar Manufacturing and Small Business Jobs Preservation Act of 2011″ – we now must re-focus our attention and energies to new US House Bill H.R. 792 (113th Congress) known as the “Traditional Cigar Manufacturing and Small Business Jobs Preservation Act of 2013″. H.R. 792 is a new bill introduced by co-sponsors Bill Posey (Republican – Florida) and Kathy Castor (Democrat – Florida) on Friday, February 15, 2013. Between the United States, Honduras, Nicaragua and the Dominican Republic the cigar industry employs over 350,000 workers. H.R. 792 provides a new classic definition of what a premium cigar is. H.R. 792 narrows the scope of the types of cigars included in the bill. In 2012, 42 healthcare groups came out against cigar rights. Therefore, we cigar rights advocates have our work cut out for us in order to recapture the momentum gained under former bill H.R. 1639. This entry was posted in 2013, Cigar Rights, H.R. 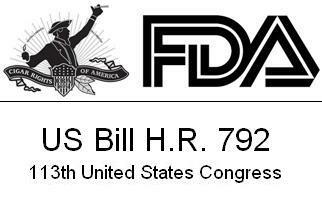 792, Kiss My Ash Radio, Legislation and tagged 2013, Cigar Rights, H.R. 792, Legislation by Stace Berkland. Bookmark the permalink.